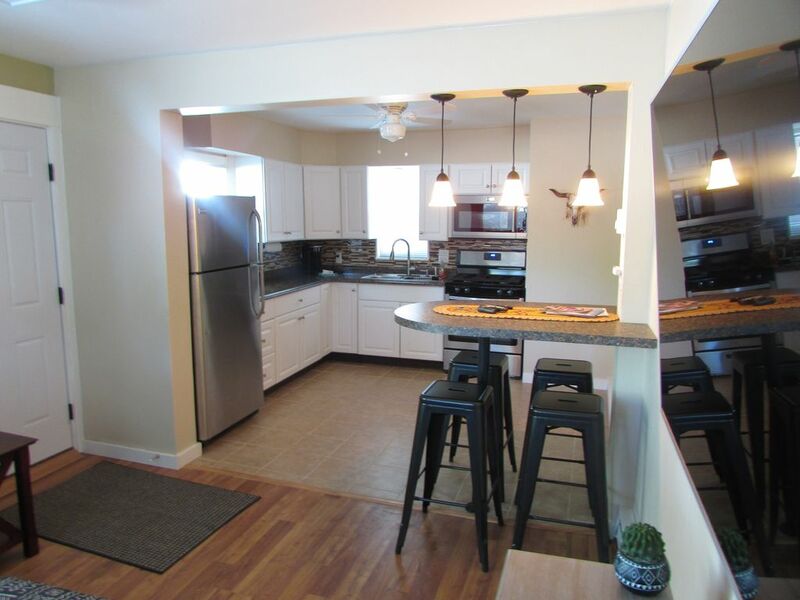 This is a 1BR 1BA apartment that is full furnished and newly remodeled. Fully equipped kitchen with all appliances, dishes and utensils. One block from main street. Restaurants are less then a block away! As well as rafting and bike shops and off road rentals. This one bedroom condo was perfect for our small family. Plenty of space for me, my wife, our 2 year old, and my mother. It is located very close to all downtown amenities and restaurants. Across the street is a very large park, community center, and playground which was perfect for our daughter. The sitting patio has nice furniture and a gas grill. It is also fenced in so we could be cooking or hanging out inside with the door open and our daughter could be playing outside. The kitchen is the best part! It is very generous in size and well appointed with updated appliances. My wife commented that she would have no problem cooking Thanksgiving dinner there! The caretaker was very friendly and helpful. He introduced himself soon after we got settled in. I would definitely stay here again and would recommend to a couple or small family interested in staying in the Moab area. This is a very clean little duplex. About 5 blocks from the heart of downtown. It has an common was between two units. Had a great stay after a short delay for checking in. It didnt bother us though as we just had dinner before checking in. Shower was awesome and the whole place was upgraded! Had a lovely Moab getaway. Location was so close to downtown. Cute place in the middle of town. Walking distance to restaurants. Great place to stay. Only con is that the only bathroom is in the bedroom. Bathroom and shower room are nice. Hide-a-bed was decently comfortable.